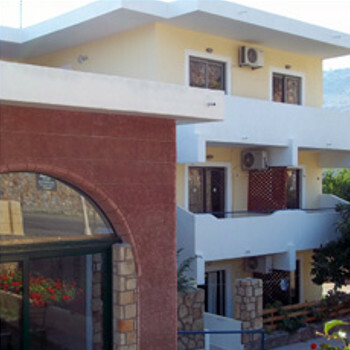 Excellent small complex of studios some 10 minute stroll from the centre of Pefkos. Basic studios that were spotless with comfortable beds. Excellent supermarket on site with an outstanding restaurant, owned by the same family, across the road. Location 10 minute stroll from resort centre. But uphill coming back, but not too steep. 400 yards the other way to nearest beach (but again uphill coming back & very steep). Don't get caught at 3.00pm coming back. However the high location gives great views across the bay. Run by Apostolis Trimmis, his wife and 3 sons & daughter. All charming and very, very helpful. The cleaner has a lovely dog that follows her around all day. We stayed in Apostolis Studios and expeienced a very enjoyable holiday. The family that run the business worked very hard to provide full satisfaction to all visitors. The rooms were very basic but were cleaned regularly and were pleasent. The restaurant just over the road was lovely with reasonable priced food and great service. Also with a outdoor pool just across the road which was clean and had lots of sunloungers for everyone with plenty of shade. Also a small supermarket next door to the studios sells anything you would need. recommended to anyone thinking of going. Apostolis and all his family are lovely and work very hard. apostolis apartments pefkos rhodes. What a fantastic holiday you are made to feel welcome from the minute you arrive.The apartments are kept nice and clean throught your stay.The swimming pool and taverna are just across the road.We found it the cheapest place around for food,which is of a high standard.Once a week they do traditional greek music and dancing.The poolside is kept nice and clean with plenty of sunlounges.It is a family run business with the owner and his family working like trojans.They also own the supermarket next to the apartments which stock anything that you could need.